A Venezuelan student stands in front of riot police during a protest against the government of President Nicolás Maduro, in Caracas. A Venezuelan student stands in front of riot police during a protest against the government of President Nicolas Maduro, in Caracas. As protests tear through Venezuela’s tonier neighborhoods, the slums are mostly quiet. Middle- and upper-class Venezuelans are burning tires and building barricades, while millions of their poorer compatriots sit out. Both groups suffer from the food shortages, inflation and crime that sparked the unrest; if anything, these problems harm pro-government Venezuelans more than anti-government demonstrators. So, what divides them? One year after the death of former president Hugo Chávez, these six weeks of protest reveal a country still profoundly split over Chávez’s political project. On one side are those protesting his successor, Nicolás Maduro, who narrowly won last year’s presidential election; on the other are government supporters who see no viable alternative to Chavismo. Asking, “If not this, then what?” Venezuelans cannot find a common answer. They disagree over a political vision for their country in part because they measure Chavismo against two different benchmarks: Chavistas compare the present to Venezuela’s pre-Chávez past, while the opposition contrasts the current economic situation with more recent developments in the rest of Latin America. Many government supporters measure life under Bolivarian socialism — as Chávez called his political program — against life under Chávez’s immediate predecessors. Mismanagement of Venezuela’s 1970s oil boom and of the ensuing collapse made the 1980s and 1990s one long economic nightmare. Severe deprivations led to riots, multiple coup attempts and, eventually, to the election of Chávez, then a political outsider. Relative to the foregoing disaster, Venezuelans did fare well under Bolivarian socialism: Incomes grew and poverty declined, as Figures 1 and 2 illustrate. Those who rally around Maduro fear the return of the pre-Chávez regime. Fifteen years after that regime fell, “No volverán” (“They won’t return”) remains a powerful pro-government slogan. It’s natural to compare a government with what came just before. But in the Venezuelan case, it’s also deceptive. 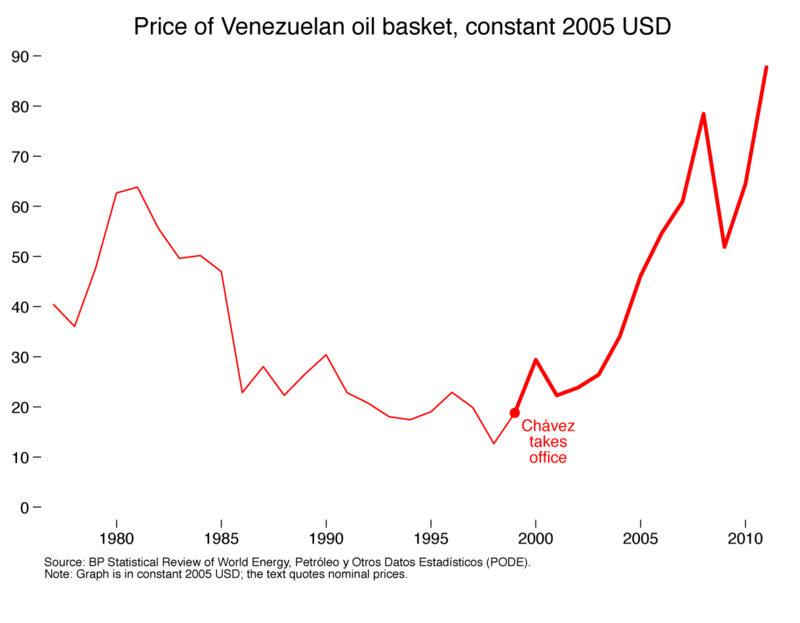 Venezuela is an oil economy, and oil prices in the 1980s and 1990s hovered around $10 per barrel.1 For reasons that have little to do with Chávez’s decisions, the price of Venezuelan oil began to rise as soon as he took office, rocketing to more than $80 per barrel in 2008 (Figure 3). 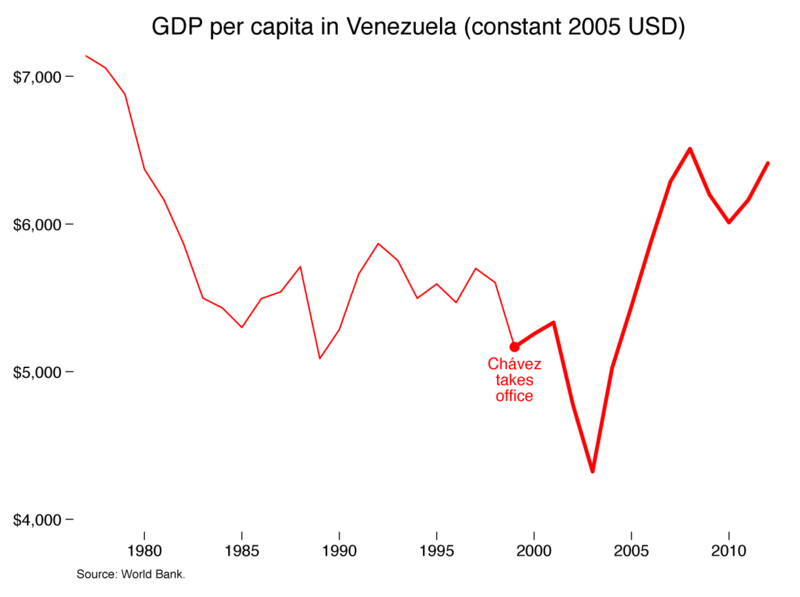 Saying that the Venezuelan economy fared better under Chávez than it did before him is like saying that gardens grow better with water than without. On all these metrics, Bolivarian socialism underperformed. 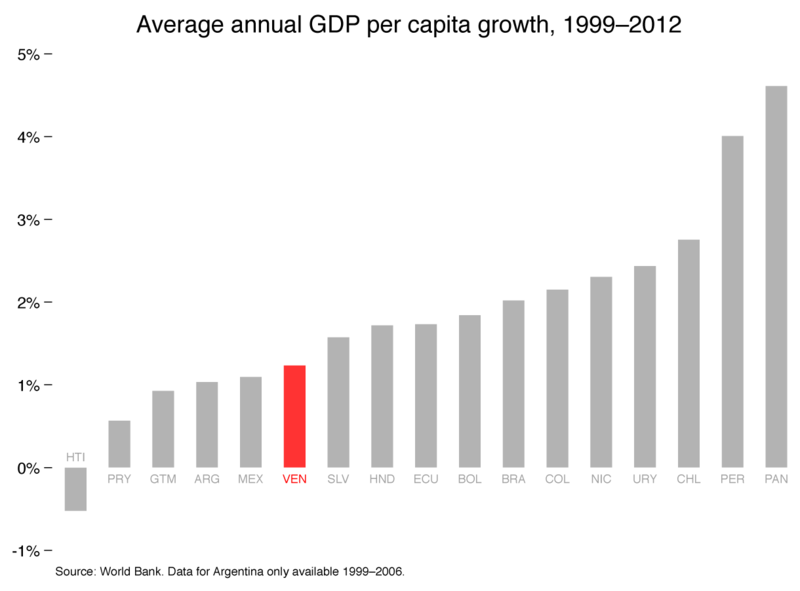 Nature handed Chávez by far the biggest resource windfall in Latin America (Figure 4), yet compared with its less-lucky neighbors, Venezuela experienced slow economic growth (Figure 5) and high inflation (Figure 6). 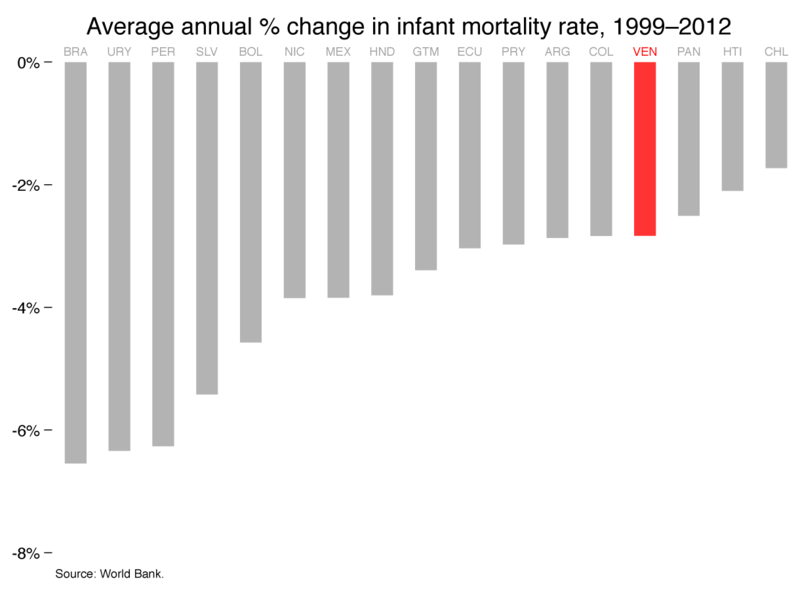 Nor did Venezuela eclipse many of its neighbors in lowering infant mortality (Figure 7), slashing poverty, reducing inequality or improving school attainment during Chávez’s tenure. 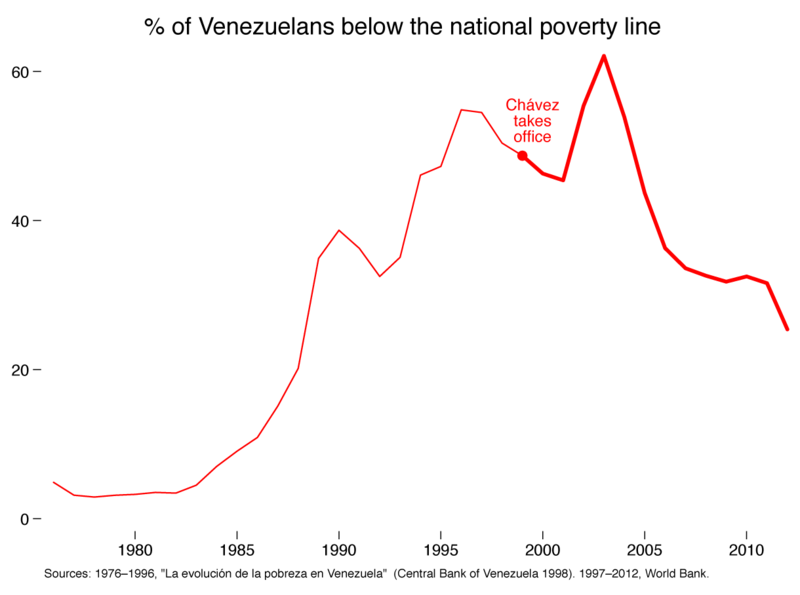 Many of the countries that surpassed Venezuela in these social achievements did so in part by implementing innovative anti-poverty programs called conditional cash transfers, in which the government pays poor women who take their children to school or the doctor. While Mexico, Brazil, Peru, Colombia and other countries pursued these highly effective policies, Venezuela scaled up projects that “one will be hard-pressed to find [evidence of] in human development statistics,” in the words of a prominent Venezuelan economist who evaluated the programs. This failure is especially stark in relation to the world-historical scale of Chávez’s promises, and to the one-time hemispheric enthusiasm for his project. A decade ago, leftists from Boston to Buenos Aires thought Chávez was pioneering a fairer, more inclusive, more pro-poor mode of governance than anything the Washington elite had to offer. Chávez styled his Bolivarian revolution as a serious challenge to U.S. hegemony, casting himself in the role of anti-imperialist hero. Venezuela aggressively sold its revolutionary dream, luring allies with billions of dollars’ worth of oil. In the end, though, most of his neighbors turned away from Chávez’s vision, and in doing so they made more progress toward many of the goals that Chávez had set for his government. In an attempt to revive the utopian fervor of the mid-2000s, one of Chávez’s glossy 2012 campaign ads (replete with strings and slow motion) claimed that Venezuela had become “a model of solidarity and social justice for the whole planet.” By then, the grandiose rhetoric sounded hollow. Even one of Chávez’s radical-left allies, Bolivian President Evo Morales, treated his country’s resource income more responsibly, as Venezuelan economist Omar Zambrano has pointed out (here, in Spanish). Among Venezuela’s regional friends, Morales ranks right behind Cuba’s Castros. Like Chávez, Morales drove his domestic opposition to hysterics with heated, anti-elite rhetoric. Like Chávez, Morales rewrote his country’s constitution and changed the nation’s official name. 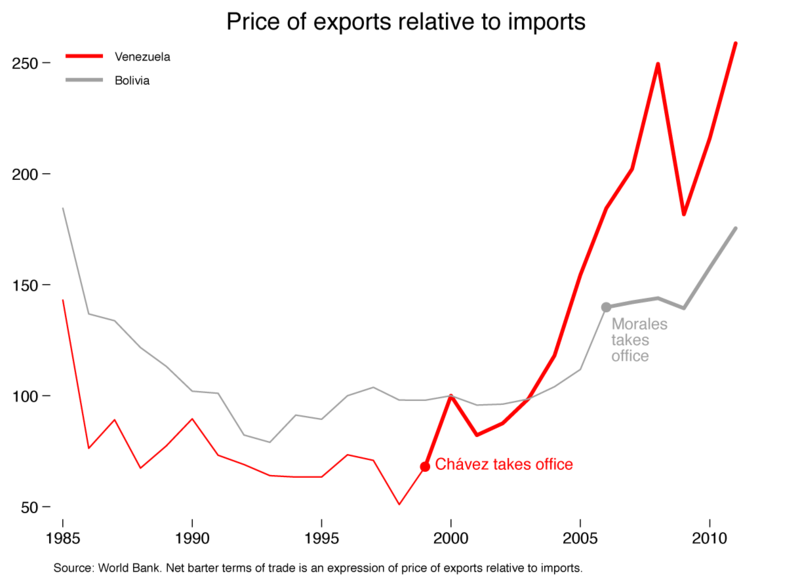 And like Chávez, Morales presided over a period of supremely favorable economic conditions; Bolivia enjoyed a similar improvement in the price of its exports relative to its imports between 2003 and 2012 (Figure 8). 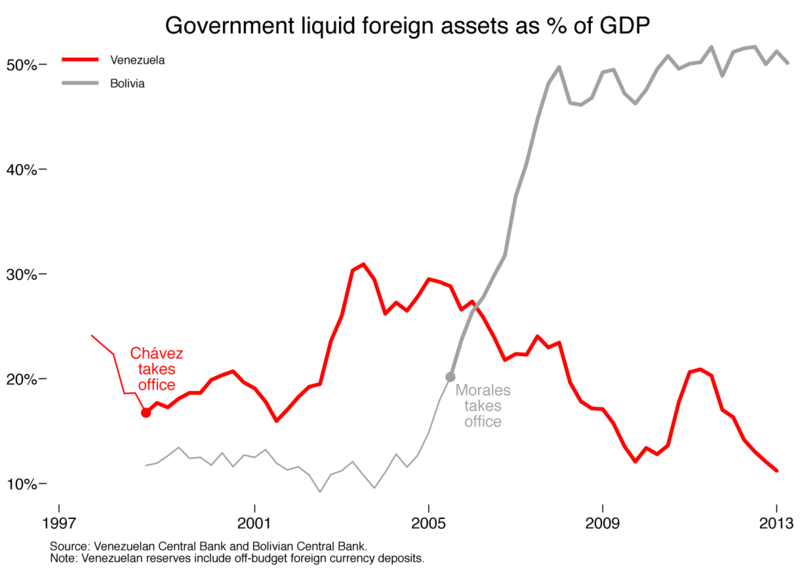 But unlike Chávez, Morales used the boom to accumulate international reserves, an important buffer against future export-price shocks (Figure 9). 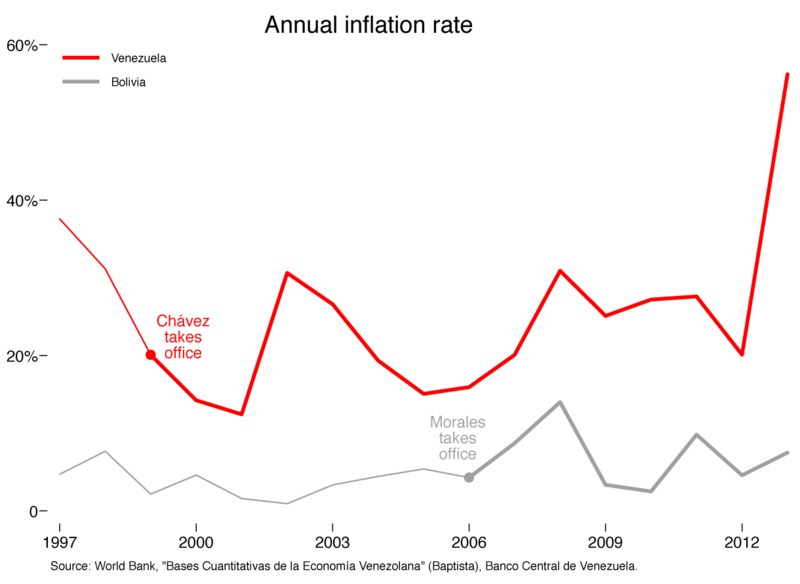 As Venezuelan inflation spiraled to 56 percent last year, Morales kept inflation in Bolivia below 10 percent (Figure 10). 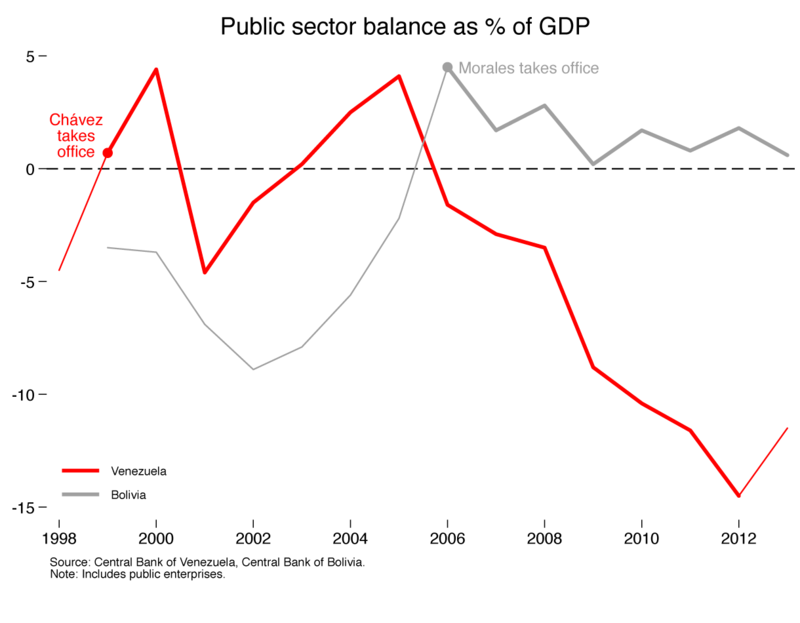 Moreover, Bolivia has used its good economic fortune to maintain fiscal surpluses, while Chavismo pushed the Venezuelan public sector to deficits approaching 15 percent of GDP (Figure 11). 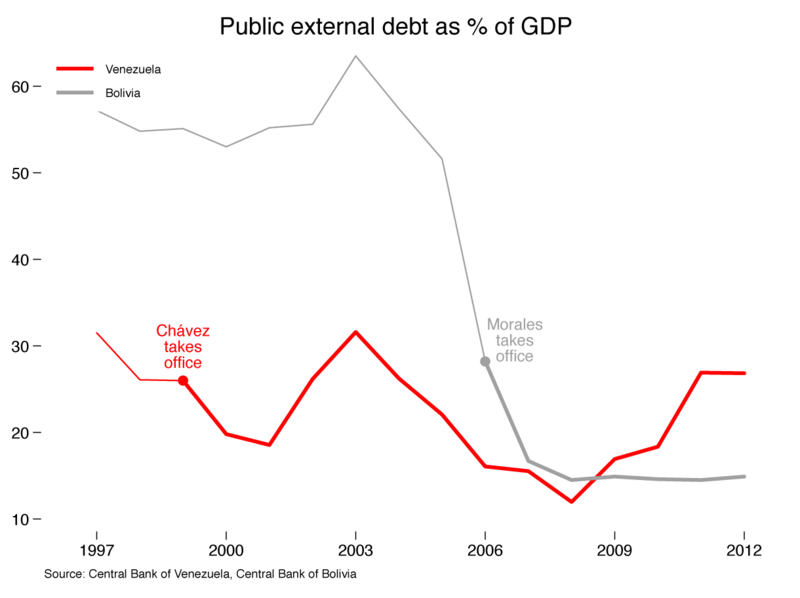 And as Bolivia paid down the tremendous debt it acquired during tough economic times, Venezuela took on new obligations (Figure 12), some of which the country will service at consumer-credit-like interest rates. When Venezuela’s mainstream political opposition takes to the streets in protest of the current regime, it has in mind the comparisons of Figures 4 through 12.2 This opposition wants a fiscally responsible government that will implement effective, modern social programs. Its leader, Henrique Capriles, made clear during his 2012 presidential campaign that he takes inspiration from former center-left Brazilian president Luiz Inácio Lula da Silva. And there are signs that, as economic conditions deteriorate, some pro-government Venezuelans might start to see the value of these regional comparisons. 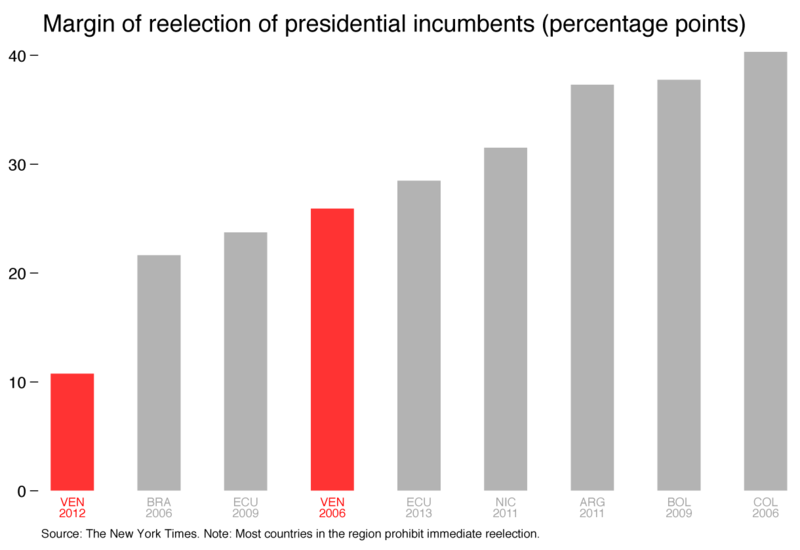 When Chávez beat Capriles by 11 percentage points in 2012, it looked like a landslide on a U.S. scale, but it was the smallest margin of victory for any presidential incumbent in the region since the turn of the 21st century (Figure 13). The irony of this fringe nostalgia is that old-regime policy mistakes closely resemble those repeated by Bolivarian socialism.4 What might help Venezuela out of its impasse, then, is a kind of reciprocal learning process: If the cosseted nostalgics could grasp that so much of what repels them in Bolivarian socialism mirrors what came before, and if supporters of Chavismo could see that the revolution reflects so much of Venezuela’s past, perhaps both sides would come around to the wisdom of the data behind the mainstream opposition’s regional comparisons. 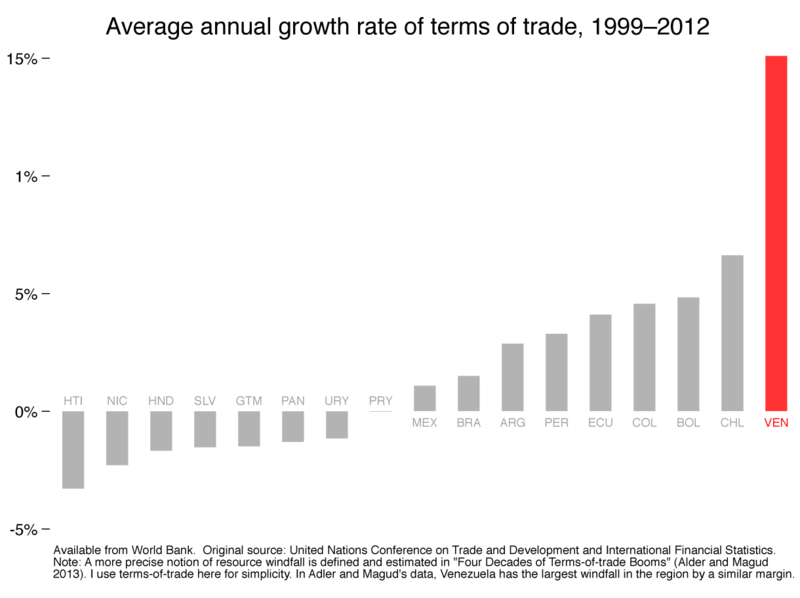 Absent this convergence, it’s hard to imagine a way forward for Venezuela. 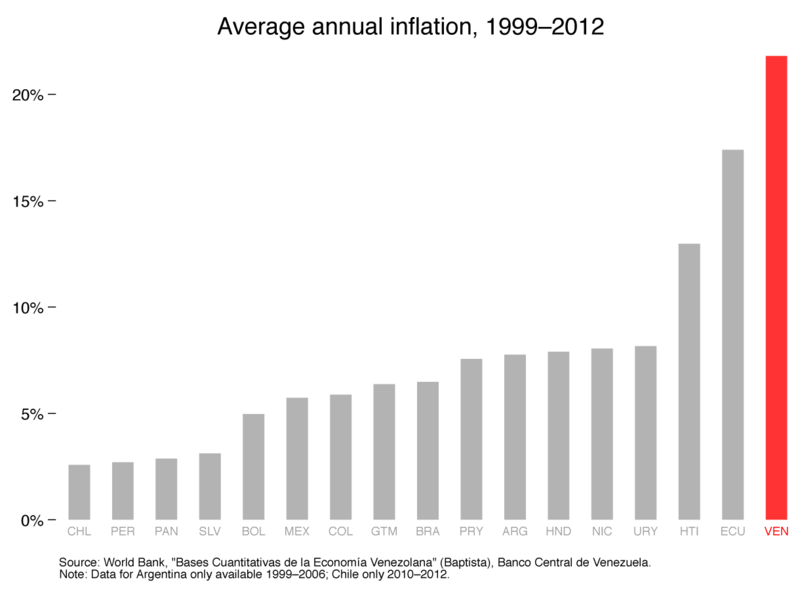 The price hit a three-decade low during the week of Chávez’s election. This article focuses on Venezuelan economic policy and economic outcomes under Chávez; for an excellent review of changes in democratic institutions — and of how pro- and anti-government Venezuelans view these changes — see this review by Scott Mainwaring. Rather than look at margin of victory, an alternative measure would be vote share of the incumbent. Margin of victory comprises vote share of the incumbent and of the challenger (that is, unity of the opposition). On this measure, Chávez performs better (though is still below the median in 2012); however, opposition unity is endogenous to incumbent behavior. A resemblance I have described in detail elsewhere. Dorothy Kronick is a Ph.D. candidate at Stanford University who obsessively follows Venezuelan politics.